This was the easiest possible choice for me. Seriously, I normally have such trouble deciding and picking one winner, but this time the answer was obvious from the get go. Sure, there are a ton of other books I’m anticipating in 2019. Some of which I’m very excited about for sure. BUT, only one book is one I’ve been DREAMING about happening for years now. Only one book that features my ALL-TIME FAVORITE CHARACTER and gives him his own duology. Only one book that made me so incredibly happy when it was announced that it was actually happening, FOR REAL. Only one book revisiting one of my FAVORITE WORLDS and does not only feature my all-time favorite character, but will also have other characters from previous series coming back. 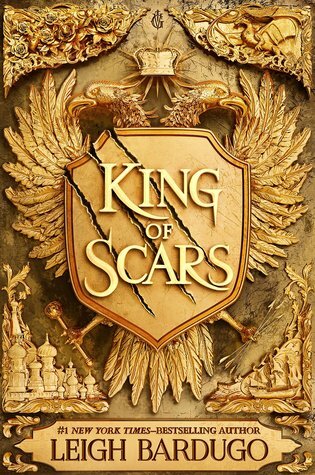 And that’s KING OF SCARS by Leigh Bardugo. Because NIKOLAI LANTSOV is THE BEST. That is all. What’s your Most Anticipated Book Release of 2019? I too am anxious for this book. Leigh Bardugo is a great writer. Very good choice. I need to finish the Shadow and Bone series so I can look forward to this one. AND, I just found out that some time in the future there will be a third Six of Crows book!!! OMG! A third Six of Crows book? OMG that’s amazing news indeed! YES! So excited for this! I’m audiobooking Crooked Kingdom right now so that I can be prepared for this! I am going to devour this book so quickly when it comes out. I need so much more Nikolai in my life. Nikolai is my favorite character from this series too. Great choice! My number one anticipated book for this year is On The Come Up by Angie Thomas.